In the market for a new Power Wheels Barbie Jammin' Jeep Wrangler? Read on. 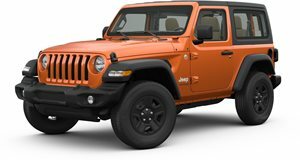 Anyone considering buying the Power Wheels Jeep Wrangler? Yeah, I know we&apos;re a little old for it by now, but who amongst us so desperately wanted one when they were young? Granted the whole Barbie theme is unacceptable, but a Power Wheels Wrangler is a pretty cool sidewalk ride for any kid. And now, Steve from LotPro Cars has made this hilarious review parody of the Barbie Jeep Wrangler. Covering everything from how it drives to interior space, Steve&apos;s ability to sound serious throughout is a great touch. We thought it was especially hilarious when he compared the Barbie Wrangler&apos;s plastic body panels to a Saturn along with the criticism regarding the so-called dashboard instrumentation. With its $265 base price, we also learn that just like real cars, Power Wheels offers a variety of Jeep models. The "top-of-the-line" Jeep Hurricane with Monster Traction runs for a borderline insane $430. Now we kind of see why many parents refuse to fork over the cash for one of these things.